Uglyworld #1326 - Lets There Be Lighters (Project BIG - Image 309-365), a photo by www.bazpics.com on Flickr. 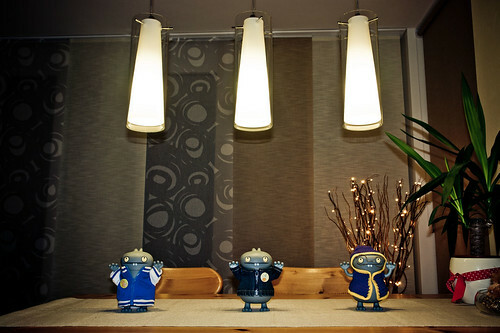 Todays I enlistereds the helpies of my gooders buddies Babo Potter and Stunters Babo to fitters the new lampers that Baz and Mireille had buyereds for overs the dinerings room tabler. I couldn't waiters arounder for Baz to fitters them as who knows what placer we could be jetterings off to in the worlds come Monday, and everyone knows that cookies tasters better when you can sees what you is eaterings! The photomagraph that you can sees here was takereds usings my remoters control shutterings releaser, as I wantereds to captures the exacters moment when the lighters went ons for the firsts timer! "Threesies, twosies, onesies, lets there be lighters...!!!". And woop woop, there was lights! Baz and Mireille will be amazereds when they comes home laters on to finds them ups and runnering, ha ha, hopefullies it will means a specialer batch of cookies for us alls, woohooo!! !